An 18ct gold diamond three-stone ring. The graduated brilliant-cut diamond line, within an elongated claw setting, to the plain band. Estimated total diamond weight 0.30ct. 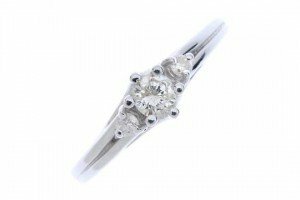 Principal diamond weight 0.25ct, stamped to band. An 18ct gold diamond single-stone ring. The brilliant-cut diamond, to the bifurcated crossover shoulders and grooved band. Estimated diamond weight 0.30ct, H-I colour, P1 clarity. Hallmarks for London, 1981. Ring size K. Weight 2.2gms. A selection of three gem-set rings. 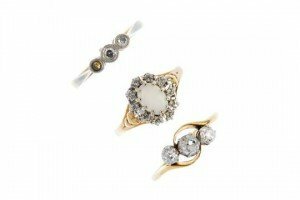 To include a 9ct gold opal and diamond cluster ring, together with two diamond three-stone rings. Estimated total diamond weight 0.50ct. One with hallmarks for 9ct gold. Total weight 6.6gms. 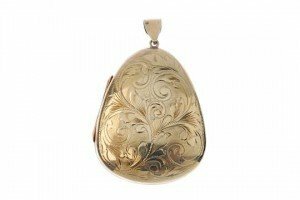 A 9ct gold locket. Of pear-shape outline, with scrolling foliate engraved front, opening to reveal two photograph compartments. 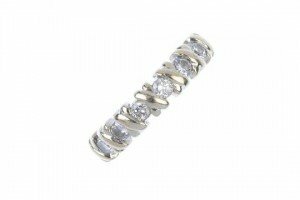 An 18ct gold diamond half-circle eternity ring. 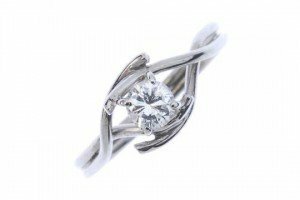 Designed as a series of brilliant-cut diamonds, with cross bar spacers, to the plain half-band. Estimated total diamond weight 0.50ct. Hallmarks for 18ct gold, partially indistinct. An enamel and diamond charm bracelet. Comprising a series of five Egyptian style charms, to include a blue enamel scarab beetle and a single-cut diamond cross, suspended from a belcher-link chain. Length 19cms. Weight 7gms. 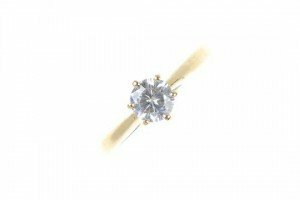 A synthetic moissanite single-stone ring. The circular-shape synthetic moissanite, to the tapered shoulders and plain band. Hallmarks for Birmingham. 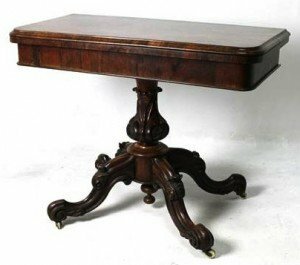 An Irish Victorian rosewood fold over card table, with a carved acanthus leaf column, raised on four cabriole legs, capped on castors. 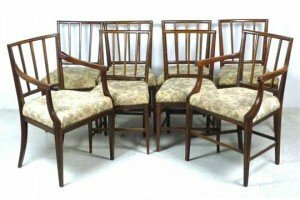 A set of George III mahogany dining chairs with cream foliate fabric upholstery, raised on tapering square legs, comprising six singles and a pair of carvers. 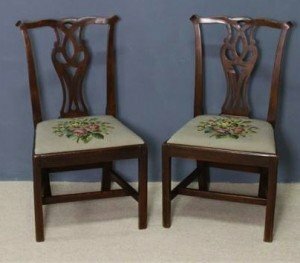 A pair of mahogany Chippendale style mahogany dining chair chairs, with strapwork backs, and tapestry drop in seats, raised on square legs united by an H frame stretcher. 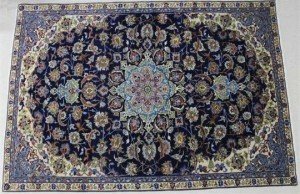 A silk central Persian carpet with a dark blue ground, central eight pointed star medallion in light blue, light green and grey, field decorated with floral lattice, light blue and cream corners. 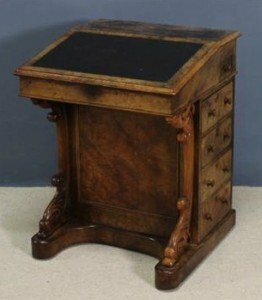 A Victorian walnut Davenport, the sloped lid opening to reveal a fitted interior, the side drawer with compartments containing cut glass inkwell, above four drawers with corresponding dummy drawers to the other side, with carved front supports and raised on castors. 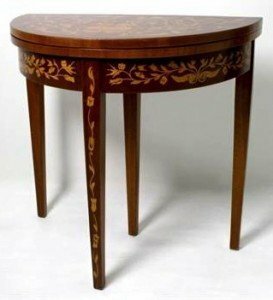 A Dutch mahogany and marquetry inlaid fold over games table, the floral inlaid D-form top opening to reveal a chess board, raised on square section tapered legs. 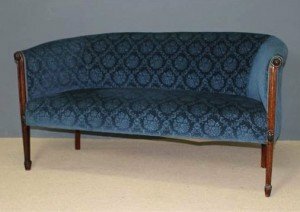 A Victorian oak framed two seater sofa upholstered in blue, patterned fabric raised on tapering square legs and spade feet. 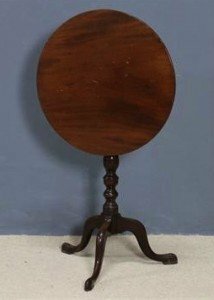 A George III mahogany tilt top occasional table raised on a turned column raised above three cabriole legs on pad feet. 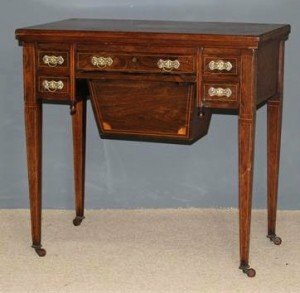 A Victorian rosewood and boxwood line inlaid games and sewing table, the fold over top opening to reveal a chess board with one long and four short drawers, pull out sewing bucket, raised on tapering, square legs, capped on castors. 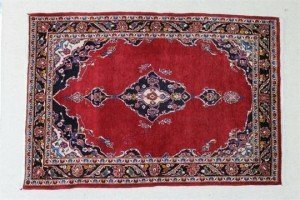 An Iranian rug with open red ground, central dark blue medallion with pendants, black and cream corners, stylised floral borders. 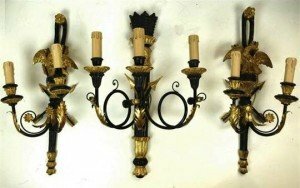 A set of three Empire style wall lights, ebonised and gilded, two having eagles surmounting the two upswept arms with foliate embellishments and crossed arrows to the back, one in the form of a quiver of arrows and having three arms bearing tassels. A German mahogany cased wall clock, enamel dial bearing Roman numerals, twin barrel, two train movement with quarter striking, the case of architectural form. 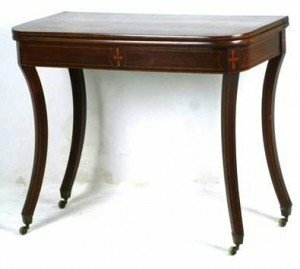 A Regency mahogany fold over tea table with boxwood and ebony stringing, raised concave legs, brass capped on castors.